OVI40 is an Open Source standalone homewbrew SDR TRX project (VLF to 2m), developed with the aim of being modular and future-proof. The talk describes the hardware and the UHSDR software including a discussion on the evolution from the "single-system" software used for the well-known mcHF (initially written by Chris, M0NKA and Clint KA7OEI) to the multi-SDR approach in the UHSDR software project. For using SDR in amateur radio applications, it is easier to use existing receiver software, or create GNU Radio flowgraphs with pre-build blocks. On the contrary, in the do-it-yourself spirit of amateur radio, this talk will guide you through the steps of implementing a simple AM/FM/SSB receiver from scratch, in plan old C, in order to get a deeper understanding of what happens actually under the hood in popular SDR software. The talk builds on the author's learning experience of creating the open source CSDR command line tool, which is used for DSP in the OpneWebRX web based SDR receiver. 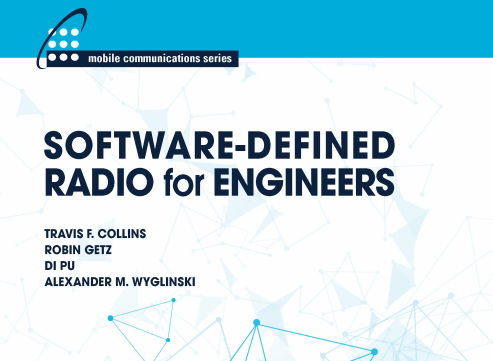 Analog Devices has recently released a new text book for free called "Software-Defined Radio for Engineers, 2018". This is an advanced university level text book that covers communication systems theory as well as software defined radio theory and practice. The book uses the PlutoSDR as reference hardware and for practical examples. 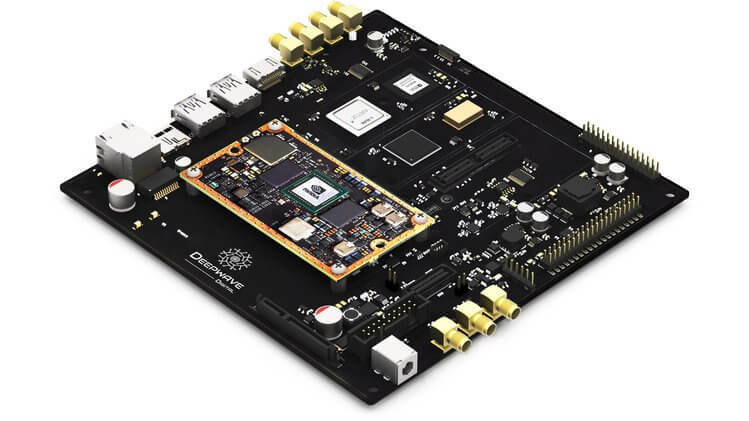 The PlutoSDR is Analog Devices $150 RX/TX capable SDR that was released about a year ago. The companion site for the book which contains links to complimentary online lectures, slides, and example MATLAB code can be found at https://sdrforengineers.github.io. MATLAB is a very powerful programming language and toolset used by scientists and engineers. MATLAB is not a cheap tool, but there is a home user licence available for a more reasonable price. To do some of the exercises in the book you'll probably at least require the core MATLAB plus the Communications System Toolkit which is an extra add on. The full book can be purchased as a Hardcover from Amazon, or downloaded freely online as a PDF. If you're interested in a similar book, there is also the free DesktopSDR book which uses RTL-SDR dongles for the practical examples. 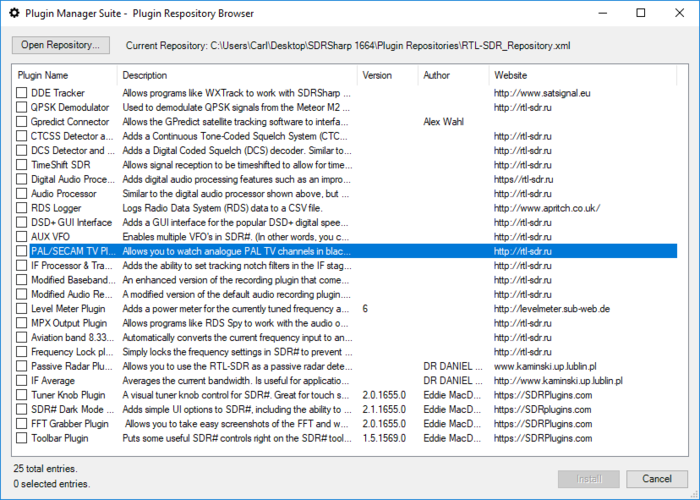 SDR# plugin developer Eddie Mac has again released a new plugin for SDR# called "SDR# Plugin Manager". This plugin is designed to make it easy to install, remove and re-order other SDR# plugins. Also included is a repository browser. This is a repository of many known SDR# plugin links which can be used to download and install a plugin with a simple click of a button. Eddie has also recently released another plugin called "Spectrum Colorizer". This simply changes the background color of the spectrum analyzer window. A good place to get started programming plugins is to download the express version of .NET (free for personal use) and install at least the C# pack. Then go to the Airspy website and download Youssef's zipped examples on coding plugins. While they are not documented you can use them as an example of the steps involved. If you know a bit of c++ that is great it should be a good spring board to learn C#. In fact, you can even program simple plugins (like my tuner knob) in Visual Basic. Both C# and VB.NET compile to Common Language Run time anyway so to SDR# it's not much difference. The only caveat is that if you want to create any plugins to do processing on signals of any sort you MUST use C# as it supports the data types SDR# uses and VB does not. As well, VB does not allow unsafe code which C# can be instructed to allow. If you would like an example of a "stencil" as you call it - a template, I would be happy to share a template in both VB and C# for you to use to start to learn. However, I would suggest begginning with C# from the start. The basics of it is that the "plugin" is actually in interface that is called while SDR# loads. The "Plugins.xml" file tells SDR# what your dll is called and what the name of the plugin is. Once it has initialized your plugin, SDR# sharp asks the plugin for a "panel" control which contains the controls for your plugin. In also returns to you a "control" object interface that allows you to receive notifications of program value changes or to set program values. There are more complex things you can do but the basics are simple. Over on his blog Ajoo has posted a very comprehensive introduction to the technical concepts behind RTL-SDR, as well as any other SDR in existence. His post first goes through the basic communications theory and mathematical concepts required to understand the technical concepts behind software defined radio. He then goes on to specifically discuss the RTL-SDR and how it works internally, mentioning what the major components do and providing useful block diagrams. In part II of his introduction he moves on to the software. Here he starts to explain a bit about librtlsdr and how the RTL-SDR drivers and codebase is put together. Further on he explains higher level software such as rtl_test, rtl_fm, rtl_sdr, the pyrtlsdr wrapper and how it could be used to demodulate FM. If you're looking at diving deeper into SDR theory then Ajoo's posts are excellent starting points. Note that the theory explanations come at about an undergraduate University level of complexity, and thus these posts are mostly for people wanting a deeper understanding of SDR. To simply use an RTL-SDR to receive signals such a deep level of understanding is not required. In a future post which is not yet available, Ajoo will introduce GNU Radio and show how to demodulate FM signals. It appears his goal is to work his way to an understanding of how GPS L1 signals work. One of Ajoo's block diagrams explaining the RTL-SDR behavioral model. 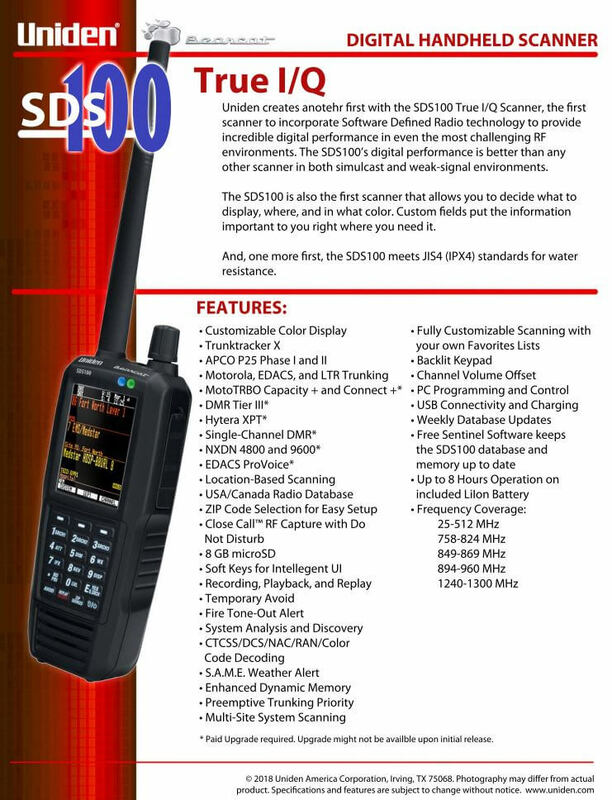 Radio manufacturer Uniden have just released news about their latest product called the SDS100 which is a handheld software defined radio scanner specifically for digital voice and trunking modes. The scanner will retail for USD699, and aims to be released in the 2nd quarter of 2018 pending FCC approval. Note that certain software decoders will require paid upgrades, but it will be capable of all the major digital voice modes such as P25 Phase I and II, DMR, NXDN and trunking modes. It doesn't seem to support TETRA since it's marketed at the American consumer, however, it seems plausible that simple software update could enable this feature in the future. 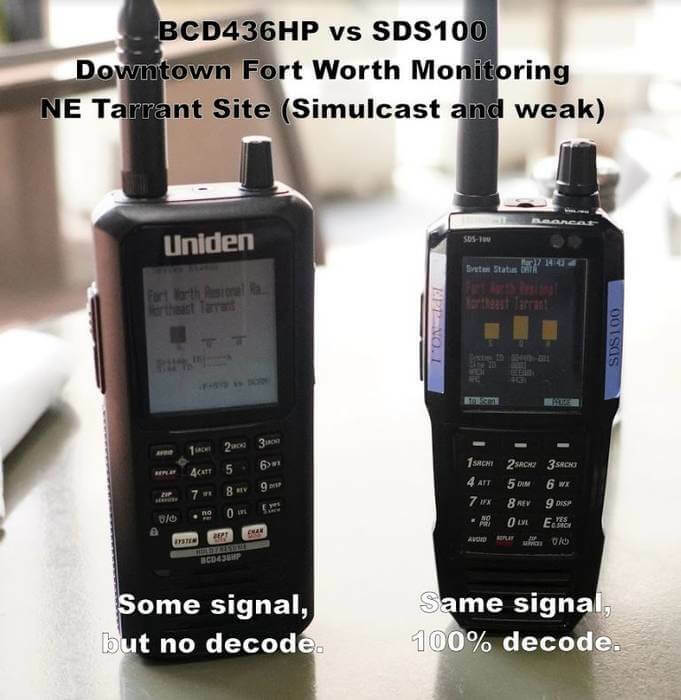 As far as we know this is the first handheld scanner to incorporate SDR and is probably one of the bigger leaps in scanner technology to date. Compared to hardware based scanners, the SDS100 should provide significantly better decoding capabilities, even in weak signal and simulcast conditions. Simulcast is when multiple overlapping base stations transmit a signal at the same frequency. This can cause multi-path distortion problems, but an IQ based radio like an SDR is able to overcome these issues. For more information you can check out this discussion thread on Radio Reference. In the future there should also be some videos of it in action available on the Uniden YouTube channel. The owners manual is also available here and all their promo material including many more demonstration videos can be found on their Google Drive.